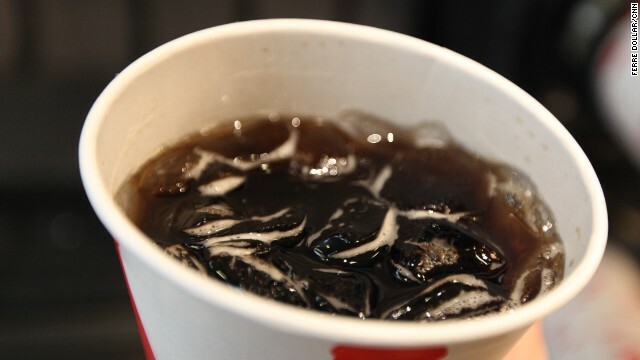 A Massachusetts mayor is taking inspiration from a controversial New York City proposal to ban large, sugary beverages - and might even want to take it a step further. Cambridge Mayor Henrietta Davis unveiled a proposal that would outlaw large-size sodas and other sugary drinks in area restaurants to the City Council on Monday. She’s also suggesting that city officials consider banning free refills of sugary beverages, which would be a step beyond New York City’s plan. The move comes on the heels of a proposal by New York City Mayor Michael Bloomberg earlier in the month to ban sugary drinks larger than 16 ounces in New York City. That ban would apply at restaurants, food carts and any other establishments that receive letter grades for food service, but it would not apply to grocery stores. Both Bloomberg and Davis have cited rising rates of obesity and diabetes as reasoning for recommending the ban. Davis’ proposal is in its earliest stages and doesn’t yet specify a drink size limit. The plan will move to the city’s Public Health Department, where a group of stakeholders - including elected officials as well as restaurant and business owners who would be affected by such a ban - will create a more clear-cut proposal, she said. Cambridge, part of the Boston area, is home to more than 100,000 people as well as Harvard University and the Massachusetts Institute of Technology. A manager of Cambridge restaurant Fire and Ice said a ban on free refills would affect the establishment. The $1.99 price for a 16-ounce soda there includes complimentary refills. About half of Fire and Ice’s customers take the free-refill offer, manager John Eller said. Bloomberg’s office applauded the Cambridge proposal. “We proposed it because it was the right thing to do for public health, and as we saw from the smoking ban, when NYC leads with bold solutions on tough issues, others will follow,” said Samantha Levine, a spokeswoman for the mayor. I think it's pretty clear Henrietta Davis simply doesn't want to be in office anymore and is looking for some way to get kicked out so she doesn't have to actually quit. I see a very scary trend here-When government starts to pay for your healthcare maybe they can tell you no refills.Maybe the next step will be a mandate (Tax) for every pound over normal weight-just include your weight(notarized of course)with your income tax form.On second thought that might be a good idea-reduction=deduction. MAADC (Moms Against Any Driving of Cars)!!!!!!!!!!!!!!!!!!!!!!!!!!!!!!!!!!!!! Banning is stupid. But the marketing of overly large drinks is nuts – when McDonalds promotes 32oz drinks for less than the price of a small soda. The law should mandate that larger sizes should never cost less than smaller sizes so we don't get marketing driven price inversion, and I wouldn't object to a volume tax on the syrup base. The government should stay on course protecting the country and controlling our diets. They are crossing the line! Just want to say your article is as astonishing. The clarity for your publish is simply excellent and i can assume you are a professional in this subject. Well along with your permission allow me to grab your RSS feed to keep updated with forthcoming post. Thanks a million and please continue the enjoyable work. Helpful info. Fortunate me I discovered your web site unintentionally, and I'm surprised why this twist of fate didn't took place in advance! I bookmarked it.